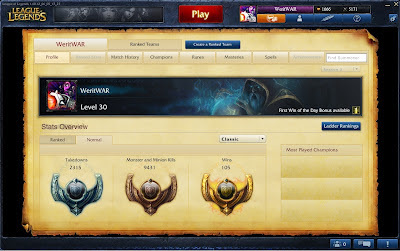 Over the weekend, I finally reached level 30 in League of Legends. It was quite a climb. It took me over 200 games to reach the level cap. I played mostly Summoner's Rift, some twisted treeline and a few Dominion matches here and there. All PvP, no bots. I don't even want to calculate how much time it took, even with XP boosts. The eternal question remains, now what? Ranked play would be the next step, but I'm not sure I am ready for that. I only really know how to play Support champions. Going into ranked matches and only being decent at a single role is probably not a good idea. I can play a few AP champs, but I really should practice ad/top/jungle. I also need rune pages for roles other than support. Although, since my support page is defensive (and general) it could still be used for the other roles. I don't really want to bring other players down in ranked because I am not prepared. Do I really want to do ranked though? The community, in those matches, seems a lot worse. Normal matches are generally, but not always, more laid back. I can't help be interested in the competitive aspect of ranked though. It gives a goal to shoot for, rather than just collecting IP.